In an ideal Plug Flow Reactor, there is no mixing in the direction of flow and complete mixing perpendicular to the direction of flow. The concentration of reactants varies along the length of the reactor but not in radial direction. This set up is used to study a non-catalytic homogeneous reaction under ambient condition. A straight tube type reactor kept horizontally and inclined upward a the outlet from where samples are collected for analysis. Pressure Regulator, Pressure Gauge and Safety Valve are fitted in the compressed air line. Rotameters are provided to measure the individual flow of Chemicals. The flow rate can be adjusted by operating the needle valves provided on respective Rotameter. The compressed air is used for circulation of feed. The set up consists of two feed tanks through which two reactants are fed to the reactor. We are leading manufacturers, suppliers & exporters of Plug Flow Reactor. 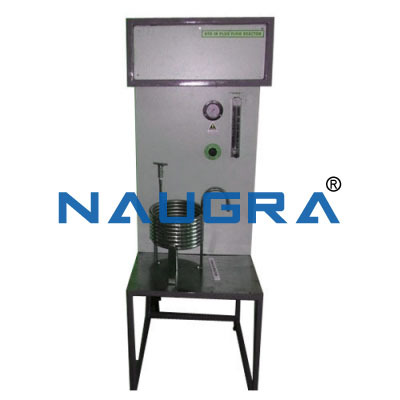 Contact us to get high quality designed Plug Flow Reactor for schools, colleges, universities, research labs, laboratories and various industries. We accept bulk orders for government tenders in all countries around the globe.